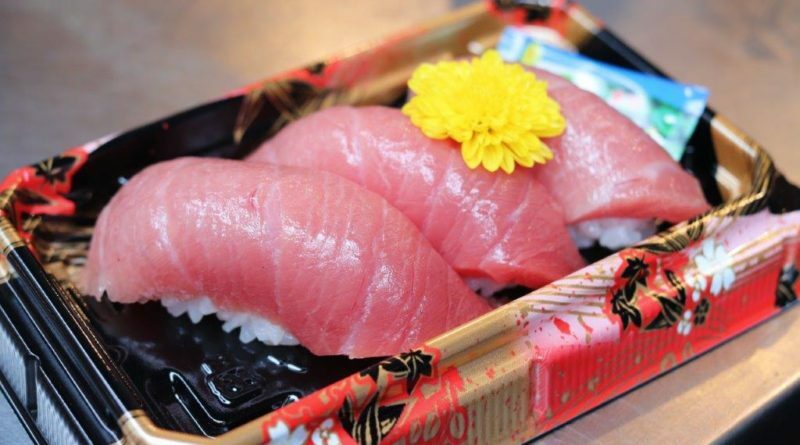 If you’re going to Tokyo, Japan, one of the places you undeniably have to visit is the Tsukiji Fish Market. While this fish market operates daily as an auction and wholesale place (mostly for frozen tuna), it has also become a MAJOR tourist attraction as they opened up many little shops, booths, and stalls around the area selling the very thing they are known for, fresh seafood. If you plan to visit, I recommend getting to the Tsukiji Fish Market by 9am. There really isn’t a point in going at 5am to watch the tuna auction… You likely will not understand what’s going on and as a tourist, you’ll get in the way of actual businessmen who are trying to conduct their daily bidding/selling. When you go at 9am, the booths have just started to open and the big crowds don’t start to come around 10:30am so you have about 1.5 hours to wander freely. 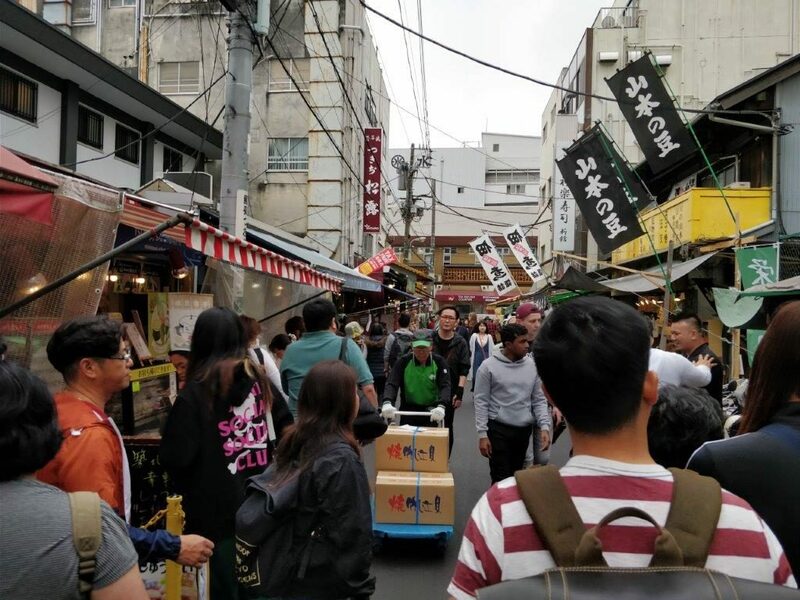 Tsukiji Fish Market is quite a huge area so it can easily get overwhelming if you have too many food options and not enough time/money to try them all. 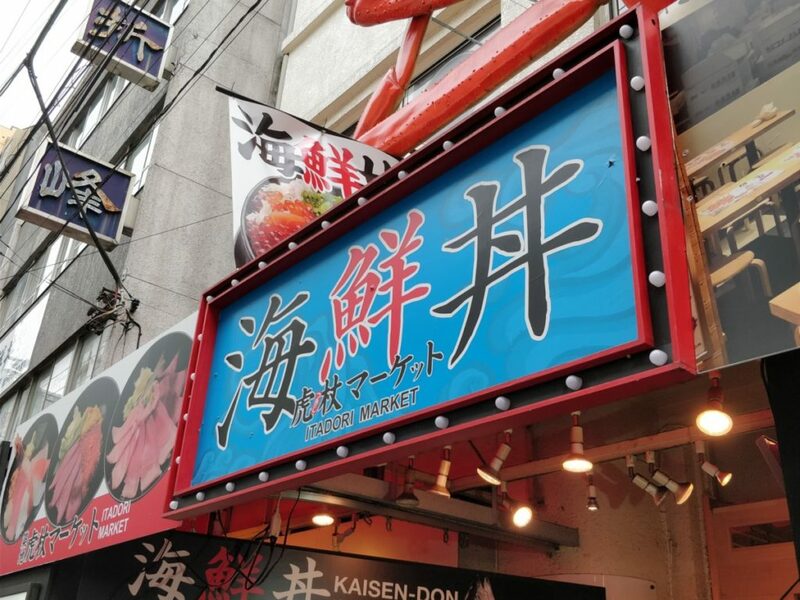 😛 With that being said, here are my top 8 food items to try while visiting the Tsukiji Fish Market. Hopefully this list will help guide you through the fish market and allow you to spend your money wisely (aka eating the BEST and most DELICIOUS items while spending the least amount of money). 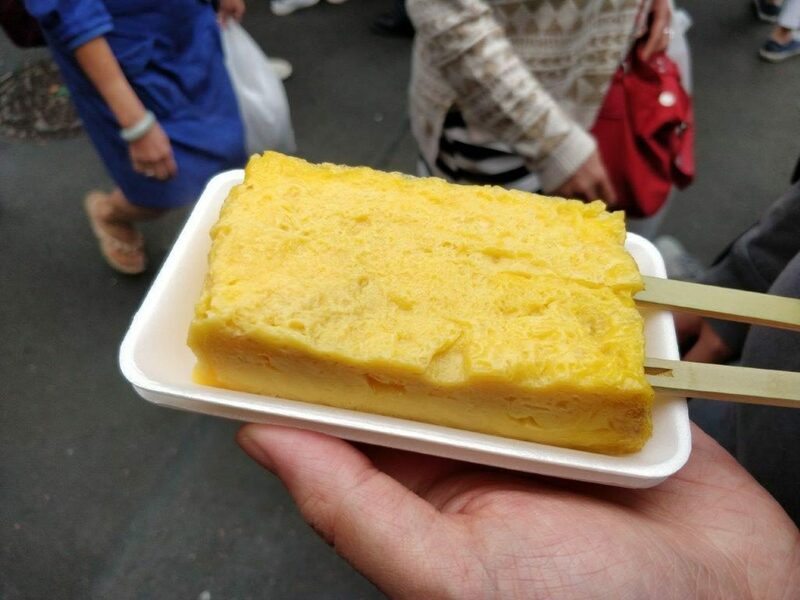 There are multiple stalls that sell Tamago on a Stick but there is one corner stall that has the biggest line up and that is where I got mine. 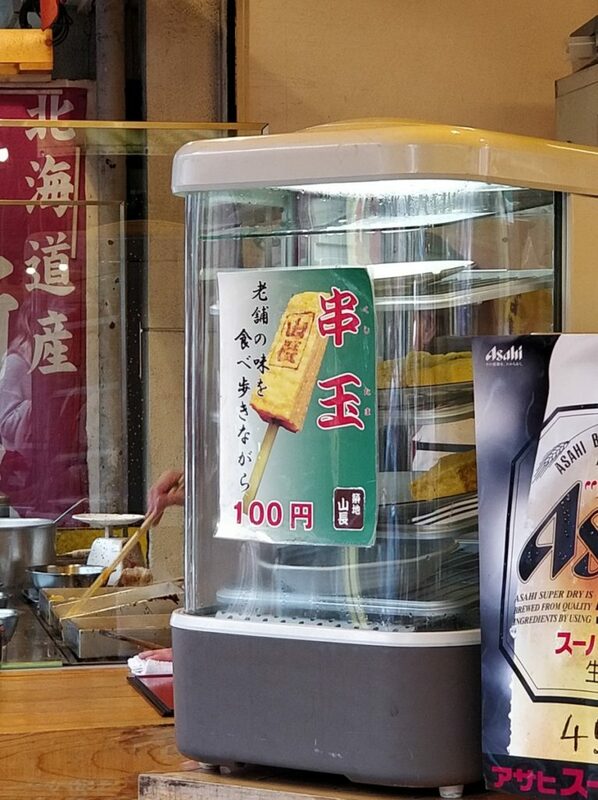 Each sweet egg omelet on a stick is 100 yen (~$0.90 USD/CAD) and is the greatest bang-for-your-buck food item at the market. The sweet egg omelet is fluffy, light, and very textured as it’s layered throughout. Tamago is ‘rolled’ which essentially means the chef cooks a thin layer of omelet in a square pan, roll it up like a swiss roll, and continues to add and roll it into shape until it becomes thick and solid. I highly recommend getting this early before the line up starts or else you’ll end up spending a lot of time just to try this. If you’ve ever had toro (tuna belly) sashimi before, you know it tastes much silkier and tender than regular tuna sashimi. 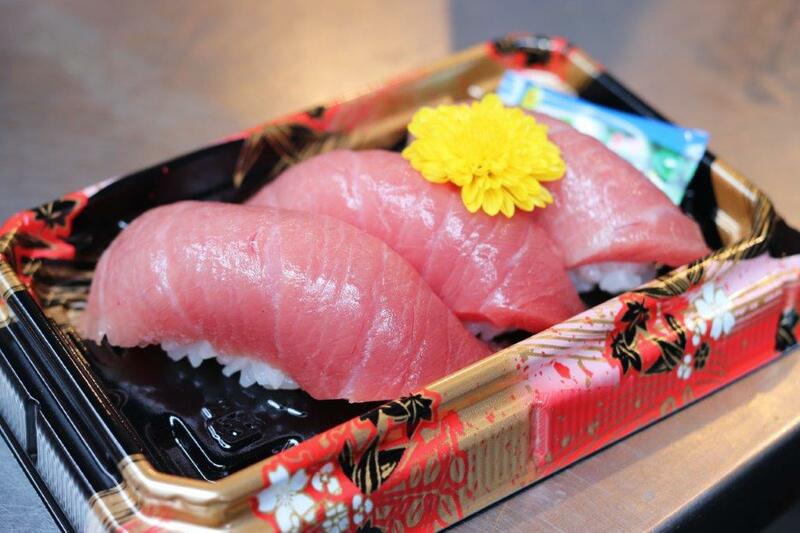 At a lot of Japanese restaurants, toro is the highest grade of tuna you can order. 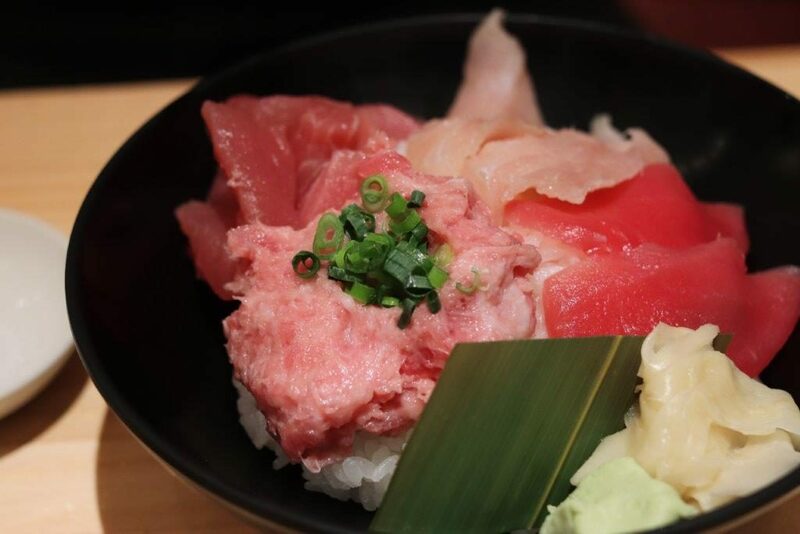 However, at the Tsukiji Fish Market, there are a few stalls dedicated to serving you the most desirable part of the entire tuna, chu-toro and o-toro. 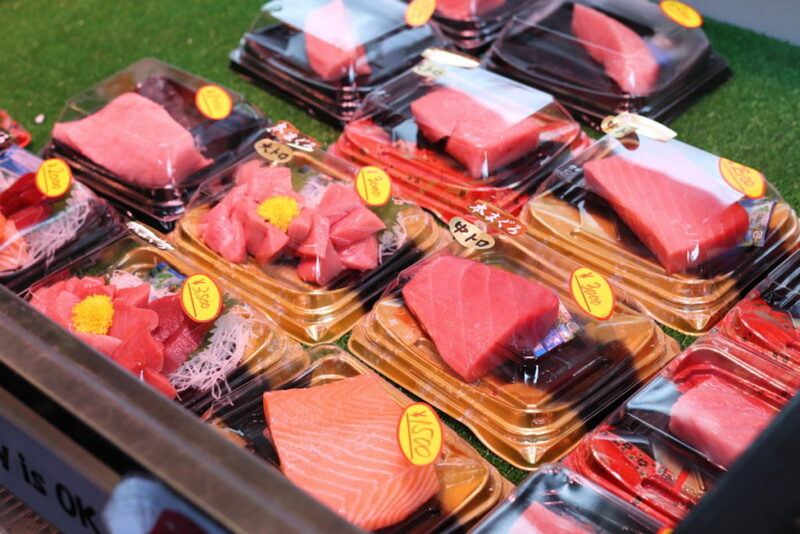 These are the most expensive and delicious cuts with a small cut of sashimi ranging anywhere from $10-$50. We chose the O-toro 3 pc sushi (1500 Yen/ $14 USD) and while it was steep on the wallet (it’s literally 3 bites!! ), it was very very worth it. As you can see from the marbling, the white lines of fat permeate through the meat in almost every direction, and dissolves like butter when it hits your mouth. I would suggest eating this on its own without soy sauce to fully appreciate the quality of the fish. This may be hard to find but there is one large stall in the fish market that only sells things on a skewer. 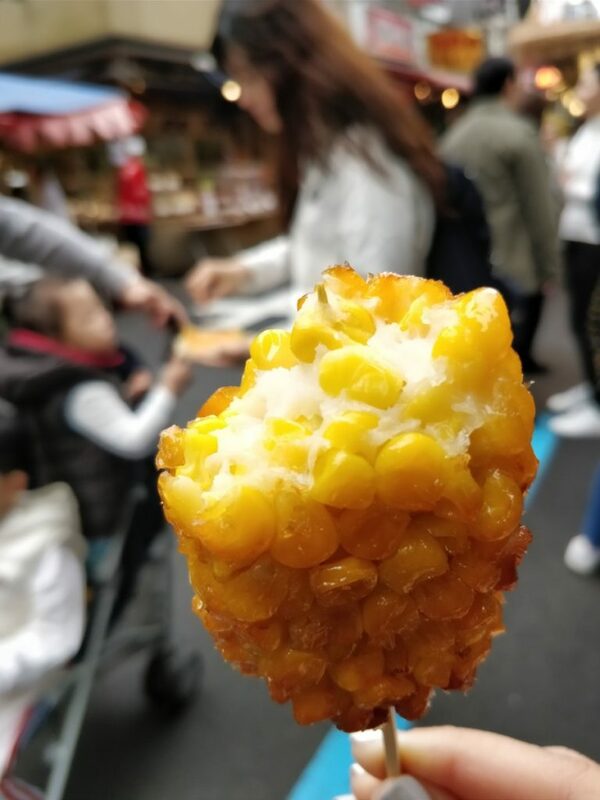 This corn croquette ($400 yen/$3 USD) is just one of many skewers at that stall but it has become so popular, most people just go there to get the corn croquette. The corn kernels are held together by a light flour mixture and its an awesome two-to-three biter as the roasted kernels burst in your mouth with every bite. 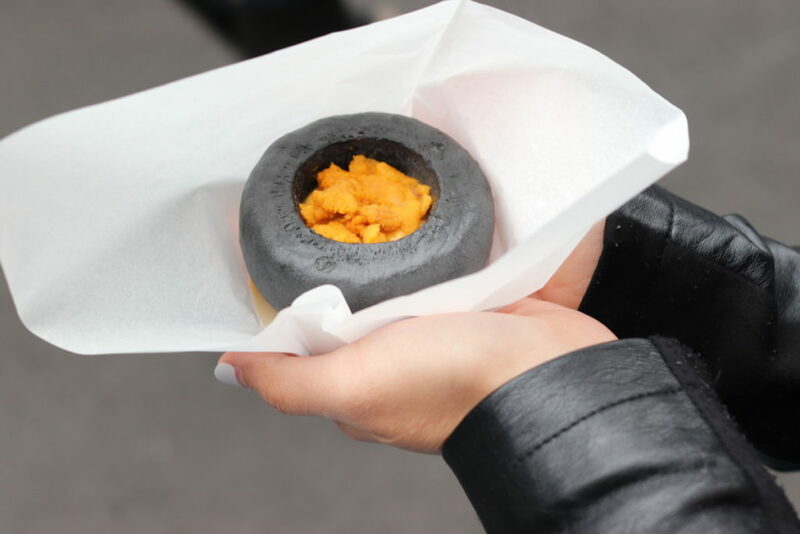 Okay ladies and gentlemen, if you are a fan of uni/sea urchin, I have got the ultimate food recommendation for you. 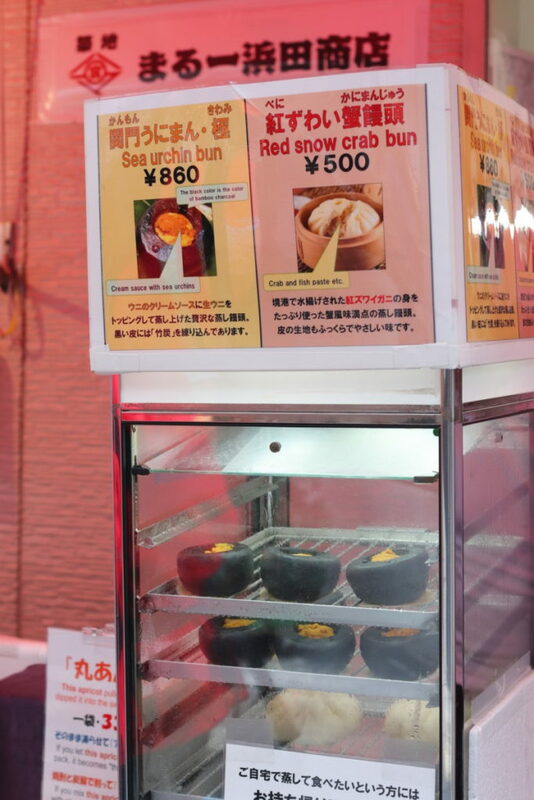 In one of the smaller alleys inside the market, you’ll find a little booth selling Sea Urchin Buns (860 Yen/$9 USD) and Red Snow Crab buns (500 Yen/$4.50 USD). It doesn’t have a long queue and this bun is very easy to miss. 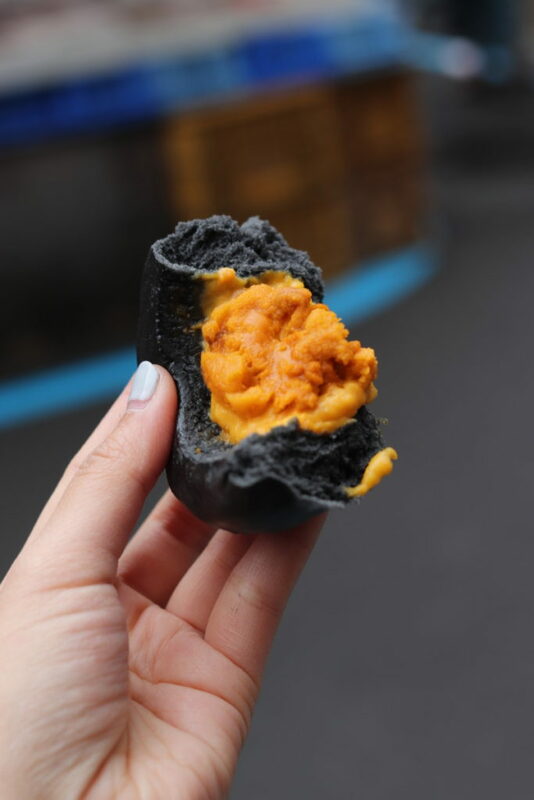 But I can assure you, the sea urchin bun is one of the coolest and most unique items you can find at Tsukiji Fish Market. 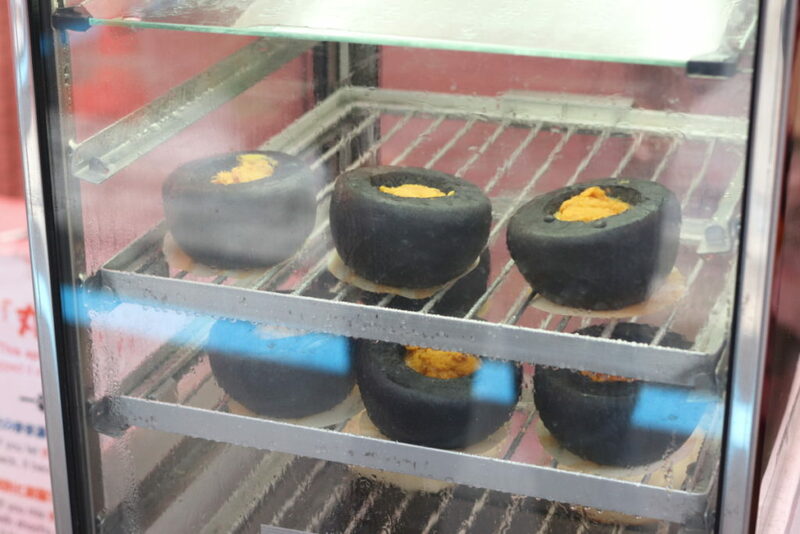 They’re kept in a warmer and essentially these black charcoal infused steamed buns are filled with an uni cream. What I like about the cream is that it still has some uni chunks in it which means they didn’t just grab a few uni pieces and pureed it with some cream. It’s legit and full of exactly what it promises. 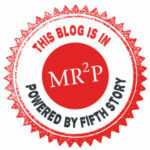 Now, I wouldn’t be a real food blogger if I left this out of the list, would I? 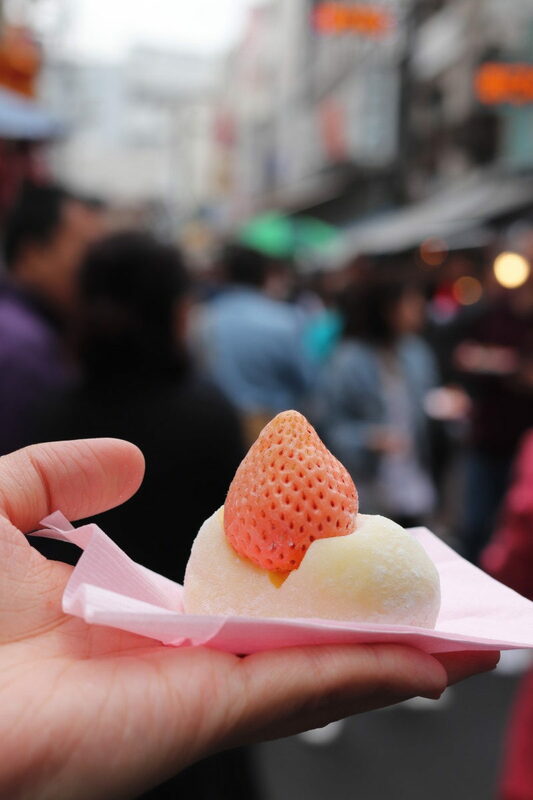 These mochi balls filled with a whole strawberry and filling (could be red bean, custard, matcha…etc) are always on the top of everyone’s to-eat list at Tsukiji and it’s for good reason. 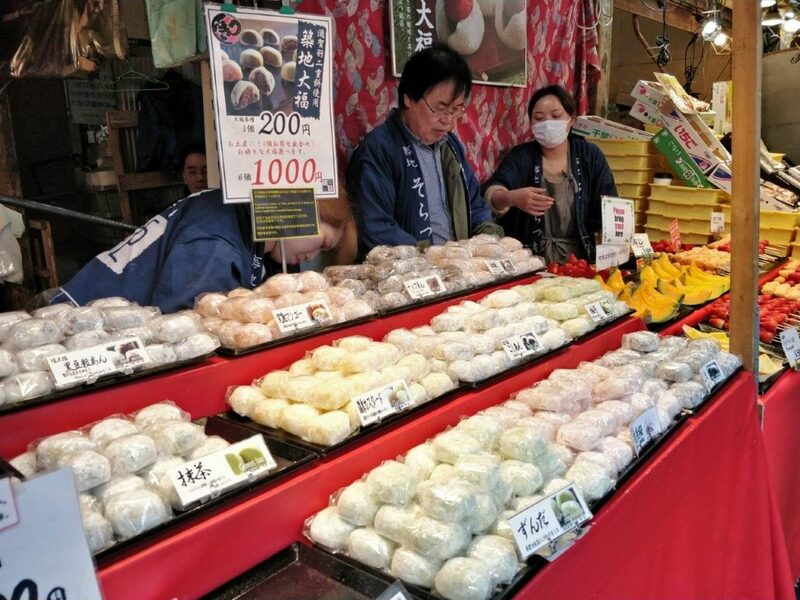 I went to Osaka, Kyoto, Nara, and Uji prior to Tokyo and I can tell you I couldn’t find daifukus as large and plump as these ones. You can choose from a regular one with a ‘typical’ red strawberry on top, or a unique ‘cool’ one with a white strawberry on top (for an added cost of course). 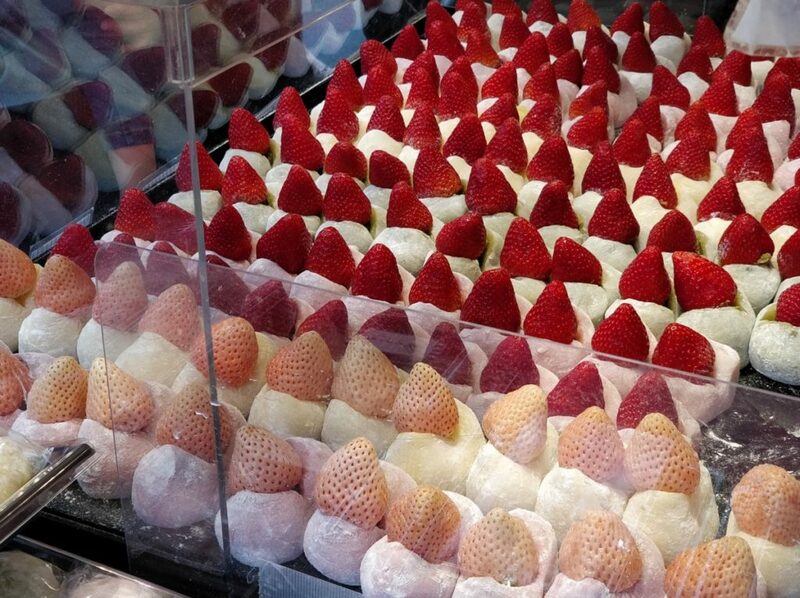 I believe they were 400 yen ($3.50 USD) for a regular one, and $~550 yen ($5 USD) for a white strawberry one. 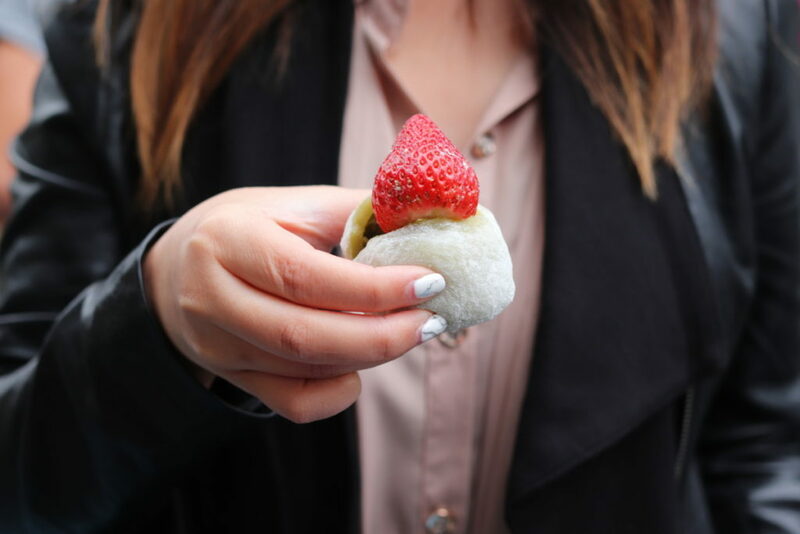 This is the Matcha Daifuku with Red Strawberry and it was oh soo yummy. The matcha mochi was delicate in texture, perfectly dusted with a light coating of mochi flour, and filled with a thick red bean paste. The strawberry tasted like it was at its ripest and was juicy beyond belief. The first one was so good, we decided to get a second one, and actually… this one was EVEN BETTER. So here’s my tip to you: If you’re not a huge fan of red bean, get the regular daifuku WITH CUSTARD. The custard cream was absolutely scrumptious and was eons better than the red bean filling. 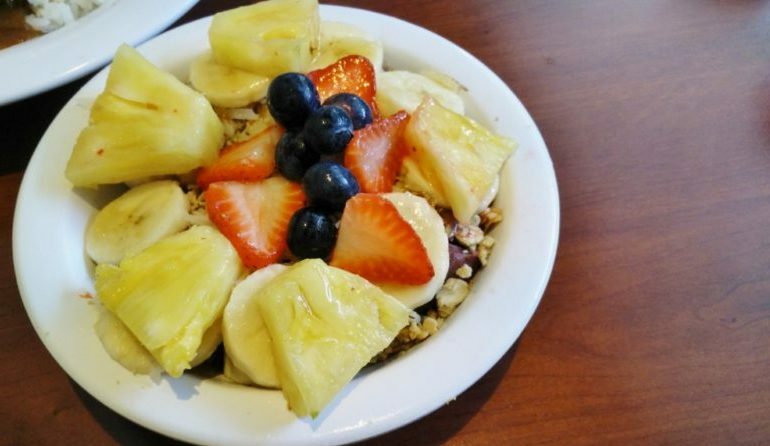 We splurged for the white strawberry and we definitely did not regret it. 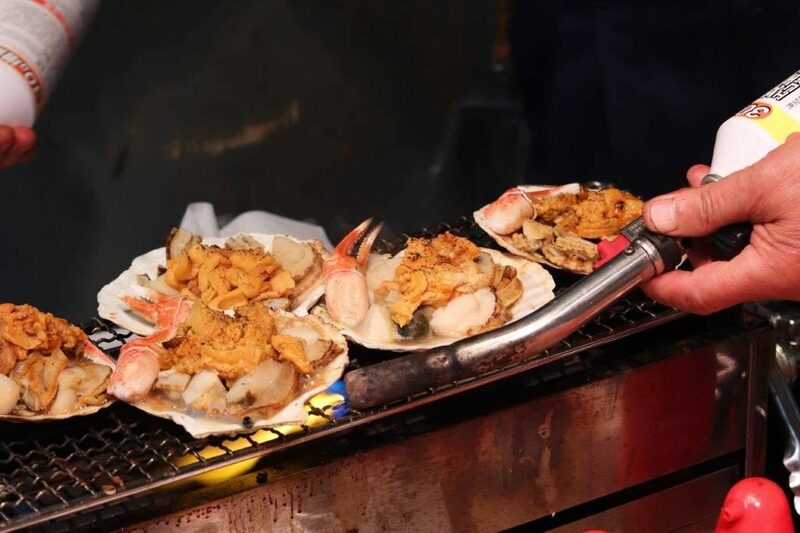 There are various stalls throughout the market that serve grilled scallops on the half shell. However only one or two stalls serve them with pieces of uni and a deshelled crab claw. I remember this being about 1000 yen ($9 USD) which sounds expensive but as someone who does not put a price on fresh seafood, this was a steal. Not only were the scallops perfectly cooked, but the sweet soy dressing they squeeze on top is the perfect marriage to tie these flavours together. 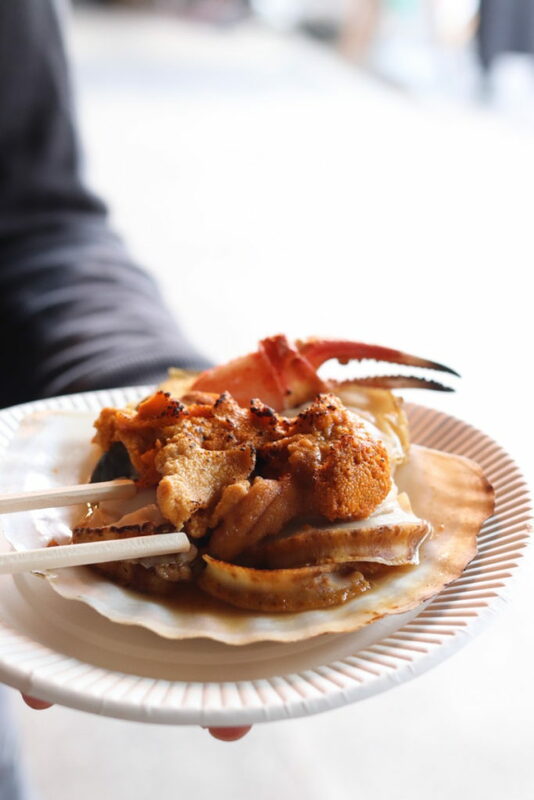 After eating all the seafood, I recommend not wasting the juices on the shell as it holds some of the deepest umami flavour you’ll ever taste. 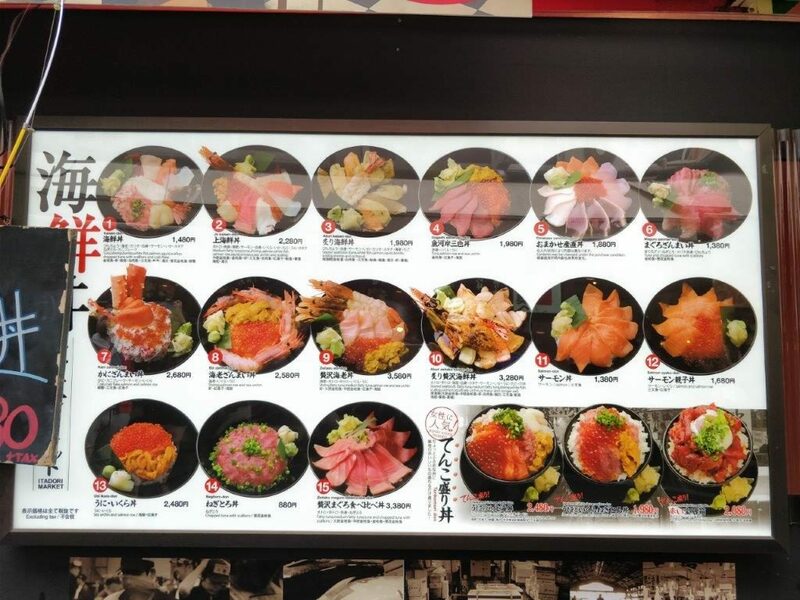 Throughout the market, there are many restaurants that sell donburis (rice bowls) with a selection of fresh seafood on top. They usually will have the entire photo menu with pricing on the outside so don’t worry if you can’t speak or read Japanese. Take a look at a few before you decide because the prices can range quite drastically from restaurant to restaurant. This one called Itadori Market had reasonable prices from 1480 yen ($13 USD) to 3380 yen ($30 USD). And after indecisively walking around the market 3-4 times, we FINALLY settled on Itadori Market. To be honest, every donburi looked ridiculously amazing so it was really hard to choose just one. Meta Knight really likes tuna so he decided on a Tuna Don that was comprised of negitoro, toro, and two other parts of the tuna. While it was really good, You can tell they don’t completely cover the rice with sashimi like in the pictures. 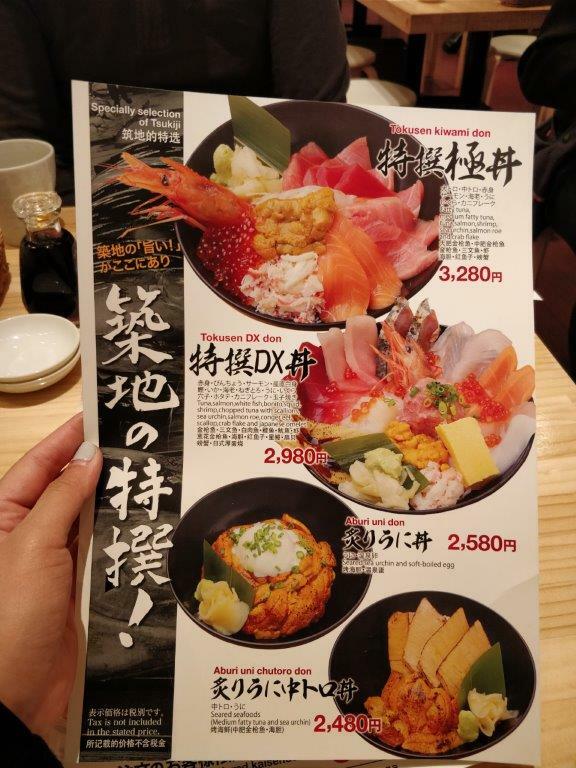 I was really craving uni (sea urchin) and ikura (fish roe) so I got the Uni and Ikura don (2480 yen/ $22 USD). 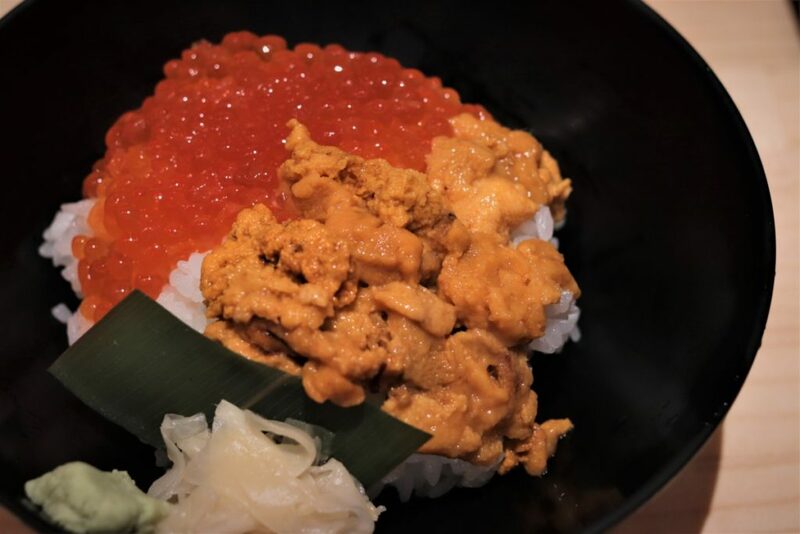 I was surprised by the strong oceany and briny flavours of the uni, and it is definitely not for the faint of heart. For novice seafood eaters, I’d recommend getting the mixed bowl with a variety of different fishes and seafood, or even the aburi one which means it’s finished off by being torched (so a lot of the briny flavours are cooked off). 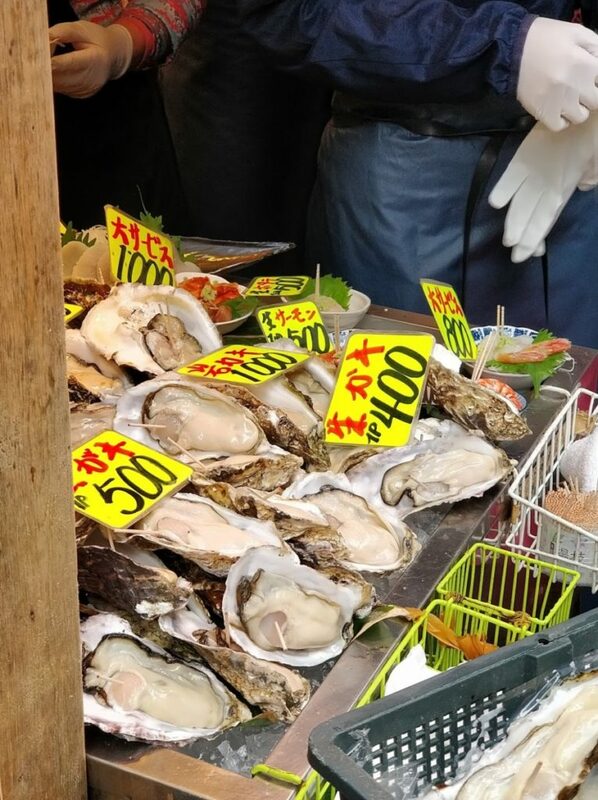 If you have the courage to eat giant raw oysters, you should only eat it at the Tsukiji Fish Market. Each oyster sells for between 400 yen to 1000 yen/$3 USD to 9 USD, and range from mid size to large. Even though I was a bit hesitant, I’m really glad I tried it. 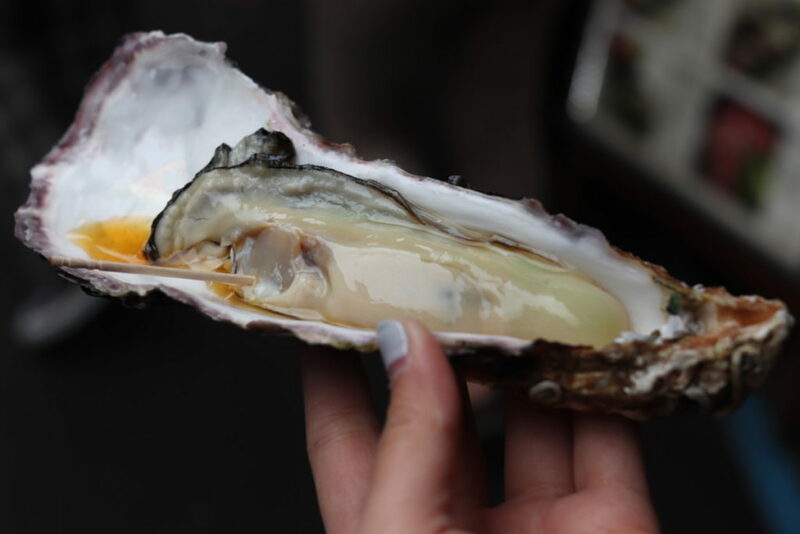 I got the biggest raw oyster I could find (~1000 yen) and it was worth every penny. There was so much meat I even had to eat it in 2-3 bites! The flavours surprisingly were not briny at all, and the light dressing they put on the oyster is all the extra flavour you’ll need. If you have the cash, I’d recommend shelling out for a couple of these because one slurp and they’re gone! Traveller’s Tip: If you’re worried about food poisoning or having an upset stomach from it, take Florastor the morning of and you should be a-okay. It’s an over-the-counter probiotic pill that will guard and protect your digestive tract. 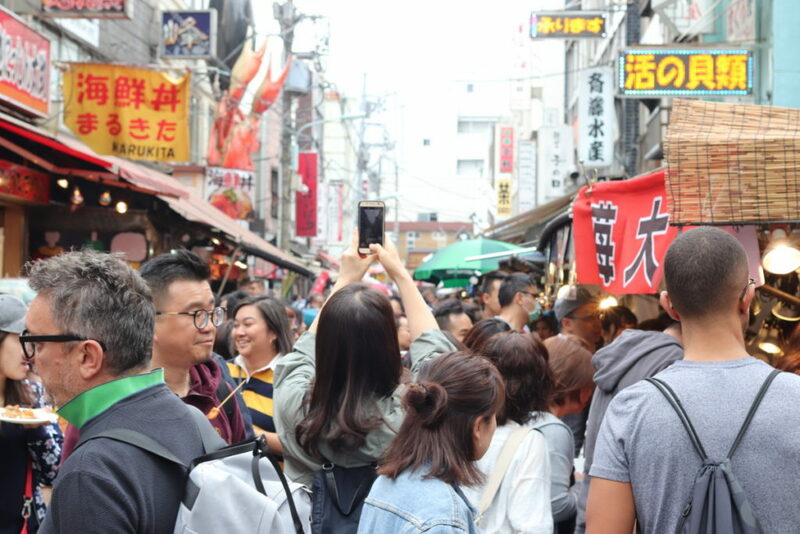 All in all, have a fun time at the Tsukiji Fish Market and be daring with your food choices as there’s truly nothing like it! If you’ve tried some other amazing food at the market and think it should be on my list, shoot me an email or write a comment below! I’d love to know what I missed (and can go back for next time I visit Japan!). 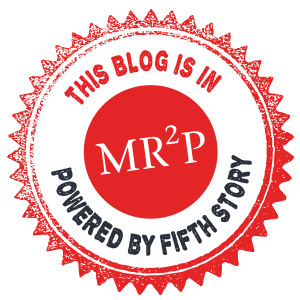 Have you checked out my other Japan foodie posts? Sushi Dai – Best Sushi I’ve ever had in my life. Period.